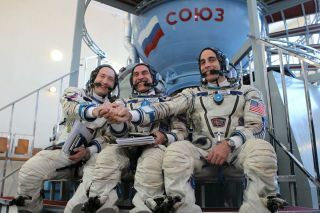 "I think it's much more interesting when you fly faster," Vinogradov said during a press conference at the crew's Star City, Russia training site. "It's just like in a train," he added, saying he preferred to make quick train trips rather than spend many hours traveling. The new travel scheme has been previously successfully tested with unmanned Russian Progress cargo ships, but never before with manned spacecraft. Officials say the time has come to speed up travel to the space station because spacecraft have become more automated, so the strain on ground-based Mission Control teams isn't so great. "Now we have onboard a new machinery and new software so the vehicle is more autonomous right now, so it is the possibility to do a lot onboard the vehicle and to calculate the burns so they are not consuming a lot of fuel," said veteran cosmonaut Sergei Krikalev, vice president of Russia's RSC Energia spaceflight company in charge of manned spaceflights. The three new space station crewmembers will join an existing crew trio to complete the Expedition 35 crew aboard the International Space Station. When that mission changes over to Expedition 36 in May, Vinogradov will take over as commander of the station. Cassidy and Vinogradov are veteran spaceflyers, but Misurkin will be making his first trip to orbit. The three will spend about six months in space, returning to Earth in September. "I think it should be the most exciting trip in my life," Misurkin said.